Indeed, make a quick visit to the websites of most of the Supermajors – that’s BP, Chevron, ExxonMobil, Royal Dutch Shell, Total and Eni in oil speak – and you’ll meet geologists engaged in a high-stakes, multi-billion-dollar race to find new oil reservoirs in risky and difficult-to-reach areas, such as under a massive mountain of salt on the ocean floor. These geological teams gather data to send to supercomputers on dry land for seismic imaging, the analysis of sonar data, or echoes captured from thousands of locations on the ocean floor. Supercomputers, software and scientists then transform this data into four dimensional models, 3D pictures of the sites overlaid with the element of time, which can reveal changes with clues to where new reservoirs may be hiding. The models help geologists determine where to drill new wells. Such computer-modeled results kept exploration teams and management of Italy’s Eni awake for 10 days straight during the 2015 discovery of the largest gas reservoir in the Mediterranean, an event the firm has documented in a video. This year Eni announced the installation of its newest supercomputer, now estimated to be one of the top 10 most powerful computers on earth. This 18.6-petaflop silicon beast (1 petaflop = a quadrillion floating point operations per second) resides in its own custom-designed, solar-powered green building in a quiet village in Northern Italy. Until Eni’s upgrade this year, France’s Total held the record for fastest supercomputer in the oil and gas industry with its much-lauded Pangea machine, installed in 2016 in southwestern France. And yet with all this investment in computing muscle, neither Eni nor Total invests enough in R&D to pass our threshold for knowledge intensity, the test of whether a company is included in the Knowledge Leaders Index of the world’s most innovative companies. But another Supermajor does pass, Chevron. Like Eni and Total, Chevron has been engaged in seismic imaging for at least a decade and in fact just announced a new deepwater discovery in the Gulf of Mexico in January. But something else is happening behind the scenes at Chevron that gives its intangible-adjusted financial statements the telltale footprint of a Knowledge Leader. So what sets Chevron apart? 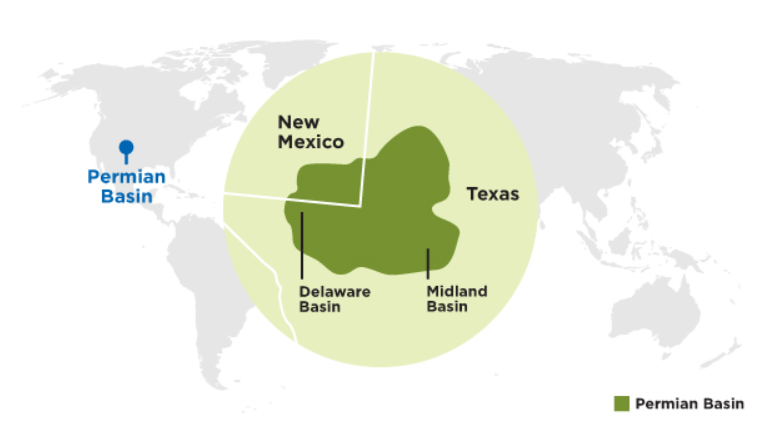 The Permian Basin, that huge shale patch in western Texas and a corner of southeastern New Mexico. While other Big Oil firms are sending exploration teams into increasingly deeper waters, Chevron is sitting on 2.2 million acres of Permian land. A new era dawned in the Permian about a decade ago, when drillers discovered the geological virtues of the Permian shale fields, oil-rich zones stacked like a layer cake, sometimes six to eight zones deep. With the emergence of fracking, this unique geological makeup made the Permian Basin cheaper to produce than other shale fields. Chevron was one of the early Supermajors to revisit the Permian with new innovations a decade ago after production peaked in 1973 then fell off. New breakthroughs in hydraulic fracking industry-wide led production in the Permian to surpass its 1973 record for the first time in 2017. By the end of the year, production in the Permian is on track to hit a new all-time high. “When we consider the impact on the world’s crude markets, the Permian has to be considered a global disrupter,” said Pete Stark, a research director at IHS in a recent report. IHS estimates the Permian still holds as much as 70 billion barrels of recoverable oil – that’s twice what it has produced so far. Chevron is the largest net acreage leaseholder in the Permian, and Chevron pays little to no royalties on the majority of its Permian land, thanks to a lucky Texaco acquisition in 2000. The beauty of the Permian for Chevron is its relatively shorter cycle from development to production compared to the complicated offshore rigs in the center of the ocean. 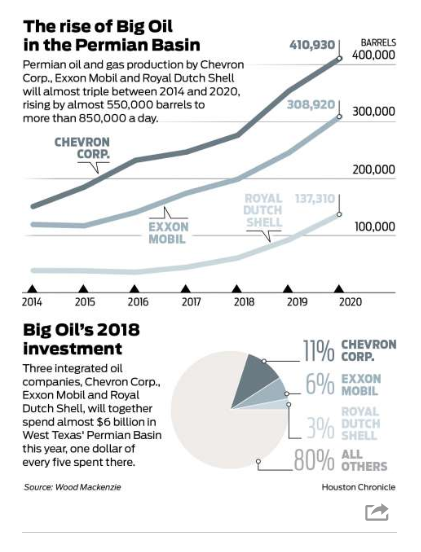 Chevron’s innovation machine is all about efficiency, and most projects point to the Permian, where Chevron plans to spend $3.3B this year, about one fifth its global spend, with the goal of doubling output there by 2022. As Chevron tells it, the key to its innovation in the Permian lies in its, “factory model,” a laser-like focus on improving every step on the assembly line. No point on the line is too small for Chevron’s innovation machine, from the robotic arms screwing lengths of steel drilling pipe together, to geophones mapping rock, to the nanolaminate coating on drill joints. Innovations are measured in tiny increments in the Permian, which “is so important to Chevron’s fortunes that saving 10 seconds each time drill pipes are linked can translate into millions of dollars in cost savings across Chevron’s huge operations there,” according to a Bloomberg report. Four years ago it took the company 27 days to drill a Permian well. It now takes 15 days. In an interview last week on Bloomberg TV, Chevron Energy Technology President Paul Siegele said the combination of proprietary technologies Chevron employs in the Permian – such as mapping, precision instruments and supercomputers – has reduced costs in the Permian by about 30% and increased production by 20-30%. His teams are at work on several pilot technologies, including an improved frack fluid for better yield. Chevron’s capital and exploratory budget for 2018 is $18.3B. That’s down for the fourth year in a row from the firm’s 2013 high of $41.9B, yet output continues to rise, suggesting the firm’s innovations are leading to Chevron’s increased productivity. As of 3/31/2018, Chevron was held in the Knowledge Leaders Strategy. The SPDR S&P Oil & Gas Explore & Prod. ETF (XOP) rose $0.33 (+0.83%) in premarket trading Monday. Year-to-date, XOP has gained 6.54%, versus a -0.31% rise in the benchmark S&P 500 index during the same period. XOP currently has an ETF Daily News SMART Grade of B (Buy), and is ranked #12 of 36 ETFs in the Energy Equities ETFs category.